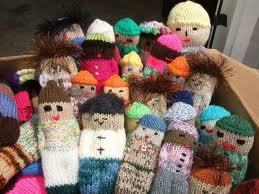 Anne, Now from KnitTraders of Kingston: Let's hear it for the Volunteers! When I heard that April 10th-16th has been set aside to recognize the work that volunteers do in our community, I naturally thought about Project Linus and the thousands of blankets that we've distributed to children in the greater Kingston area, blankets that have been kindly made and donated with yarn that is often donated too. When WOOL-TYME Kingston took on the role of coordinating the local chapter of Project Linus, we were collecting about 10 blankets a month. Now, through the generosity of so many contributors, we are up to about 50 blankets each month! Then that got me thinking about volunteers in general. In sorting out the yarn donations that we receive regularly at the store, there is some yarn that isn't of use for the purpose of making children's blankets so I have a list of about 7 or 8 other charities who are always ready to accept the baby yarn, the Phentex, the fancies to make projects for their own fundraisers. Furthermore, each location to which we deliver the Project Linus blankets: Children's Aid, Almost Home, Interval House and Dawn House and many others, all have their own group of dedicated volunteers who are committed to their own work. Being a business, we frequently receive requests for donations to fundraisers. This week alone we were privileged to receive a request from the Canadians for Women in Afghanistan for their upcoming Gala and the Andrew Trudeau Memorial Golf Tournament raising funds for the Mental Health Assoc. and for projects working against impaired driving. Then my friend who is a nurse working in palliative care sent me a copy of an article about the "Izzy Dolls" ,which originally gained popularity being made for children in war torn areas, but from her perspective, my friend says that they are invaluable for calming people who are stressed and/or suffering from dementia. In an upcoming newsletter, we'll be offering the link to the pattern and a bit of encouragement to our customers who would like to make some to be distributed locally. Finally, I started thinking about my own humble volunteer cap that I wear (figuratively speaking) and I'll let you in on the secret that I've discovered to feeling great about any volunteer job that you choose to do: BRING FOOD! Every time I show up at the local shelter fo r which I've been making sandwiches for at least 8 years, I'm greeted by staff and residents alike with appreciation and actual joy (especially when there are some cookies or other treats accompanying the sandwiches). 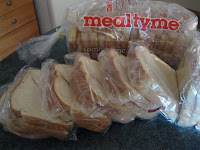 Twice a week I deliver these sandwiches made of white bread, margerine, processed meat and mustard (at their request). Except for the mustard, we wouldn't probably have any other these other products on our regular shopping list, but although salami sandwiches are not my cup of tea, I DEFINITELY understand the value of comfort food to someone who is going through a rough patch. So I started calculating the output and by my estimation I've buttered 16 000 pieces of bread to make 8 000 sandwiches over the past 8 years. And of course my only wish is that they weren't needed but while they are, I plan to keep it up. Posted by Now: KnitTraders of Kingston at 10:53 a.m.
That's amazing that you do the sandwiches all on your own! Such an inspiration! Sun. May 15, 10:39:00 a.m.